SWITCHEX all-in-one driver/dimmer for LED products combines an in-wall LED dimmer switch and power supply into a single integrated unit that mounts into a standard recessed single-gang electrical switch box. This eliminates compatibility issues between driver and dimmer. Installers are no longer required to purchase a separate LED power supply and a dimmer switch to power and control low-voltage LED lighting. SWITCHEX accepts 120 volt AC and converts it to low voltage 12V (60W max) or 24V (100W max) DC. 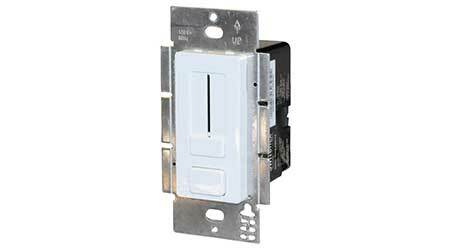 It includes a single pole pre-set dimmer with on/off push switch. Dimming is smooth and adjustable from 100 percent down to 5 percent. SWITCHEX is cULus listed and conforms to NEC code. A voltage output dial addresses voltage drop, and a voltage barrier partition is included to install high and low voltage circuits in the same switch box. No derating is required when ganging units and there is no minimum load. SWITCHEX also has power failure memory: If power is interrupted, the unit will return to the setting prior to the interruption. Face plates are offered in three options: glossy white, glossy light almond and glossy dark brown. Decora trim plates are not included. Nora products compatible with SWITCHEX include: Nora LED standard wet and damp tape light, LED Hy-Brite tape, LED standard side-lit tape, LED high output tape, LED lightbars, LED puck lights and LED flex lights.